*Be sure and check out my HUGE collection of photos here. I attended the first annual Kirk Von Hammett’s Fear FestEVIL at the Regency Ballroom in San Francisco. A festival organized by Kirk Hammett of Metallica celebrating all things horror related and heavy metal. The weekend was made up of panel discussions, performances by metal bands and memorabilia displays. It sounded like a very interesting idea and I was excited to be there. I walked in the main entrance to find the main lobby area decorated in a horror theme and would go on to see that many areas in the venue were decorated this way as well. I took a walk around the venue to get a good look at everything. In the main ballroom there were vendors set up, a table where the autograph signings of the headlining bands would happen, booths to get your horror style make up done, pinball and guitar displays. I went downstairs to the official vendor area and there was a ton of interesting stuff for sale. Movie posters, toys and clothing were just some of what was available. Doyle from the original Misfits had a table down there promoting his new album. At one table people were working on model heads. From there I headed upstairs, the elevator was very old school and the operator was dressed as a zombie adding to the overall horror feel of the fest. Once upstairs I walked through an area of smoke and lasers with life sized models of things like the Alien from the Alien movies. Then I entered what was titled “Kirk’s Crypt”. It was the Lodge of the building, which was transformed to the Crypt by adding a huge selection from Kirk’s private collection of horror memorabilia. There was many life sized replicas of horror movie monsters and props from horror movies as well as Kirk’s horror themed guitar collection. This is also where the panels would take place. In the room next to the Crypt was a celebrity signing room with horror movie stars like P.J. Soles from the Halloween movies and Heather Langenkamp from the Nightmare on Elm Street films. I headed back to Kirk’s Crypt for the first panel of the festival. The panel consisted of Kirk, director Rich Correll and sculptor Mike Hill discussing their collections and horror memorabilia and its appeal. Next up was a demonstration in the main ballroom. Scott Ian of Anthrax was being transformed into Jack the Ripper by Joel Harlow, a special effects artist that is best known for his work on “Pirates of the Caribbean: Dead Man’s Chest”. Over the next two and half hours they discussed random topics while Harlow applied makeup and prosthetics to Ian with the end result being a very impressive representation of Jack the Ripper. The next panel was Kane Hodder who played Jason Vorhees in four of the Friday the 13th films. He discussed what it was like to play Jason. One of the more interesting bits of information was that he made sure to breathe heavily so you could see his chest moving up and down when Jason was staring at people, so it wouldn’t just be an entirely motionless Jason. He also discussed the difficulties of filming a scene where he had to be underwater. The following panel was P. J. Soles, Heather Langenkamp and Patty Mullen of Frankenhooker. They discussed the role of women in horror and how that role evolved over time. Next up was a panel of the master of horror special effects and make up artisty Tom Savini, his protégé Greg Nicotero the special effects makeup artist from the Walking Dead as well as many movies, and writer of the original Night of the Living Dead John Russo. They discussed their previous works and the role of zombies in horror and slow moving vs. fast moving zombies. The last panel of the day was Kirk and Greg Nicotero. They were joined on stage by Scott Ian who was now fully transformed into Jack the Ripper. They spoke about how they had been friends since the 80s, that Greg had given Kirk his first piece of horror memorabilia and that’s how Kirk’s collection started. By the time the last panel ended Carcass was about to take the stage and rock the place with the first musical performance of the night. They got the crowd riled up and many in the audience seemed impressed with the performance. Next up was Exodus. This was a huge deal, as Kirk started Exodus in 1980 before leaving to join Metallica. They came out and were the loudest show I have ever been too. Just non stop, loud as hell thrash metal. Singer Rob Dukes encouraged the crowd to get rowdy and start a circle pit, and the crowd was more than happy to. They played a lengthy set of both new and old material including songs like “Blacklist”, “Bonded by Blood” and “A Lesson in Violence”. After their main set ended Kirk came out and joined them for performances of “Piranha” and Blue Oyster Cult’s “Godzilla”. During “Godzilla” a person in a large Godzilla suit came out on stage and rocked out with the band and that ended the evening. The second day started with a panel of Ron Chaney Jr., Sara Karloff and Bela Lugosi Jr., all family of horror legends. They spoke about their famous family members and how their legacy continues to carry on. Next was a panel of Haruo Nakajima, the actor that played the original Godzilla and Bin Furuya, the actor who played the original Ultraman. Through an interpreter they took questions from the audience about their experiences acting. Nakajima showed a comedic side with many of his responses being some form of “it wouldn’t matter, I as Godzilla would win”. They also discussed the long days of filming and difficulties of even getting in their costumes. Furuya mentioned that once he was in his suit he had no way to get out himself and was at the mercy of the crew. Despite the language barrier they had a very entertaining panel. At the end they did some posing as their characters with Furuya even having a couple small pieces of the Ultraman costume on. They were joined by the Godzilla that showed up on stage the previous night and did some mock fighting poses with him. The following panel was Kirk and Basil Gogos. Basil is the artist who painted many of the covers of Famous Monsters magazine and his paintings are some of Kirk’s favorite pieces in his collection. The panel consisted of Kirk gushing over Basil and his art and he gave him an award for artistic achievement in horror. Over the course of the panel Basil discussed his technique and how he worked as well as taking questions from Kirk and the crowd. The final panel of the festival was the most anticipated. The whole room was filled for Kirk, Slash, Doyle formerly of The Misfits and Kerry King of Slayer discussing horror and metal. Scott Ian was supposed to be included but cancelled and they had Doyle fill in. 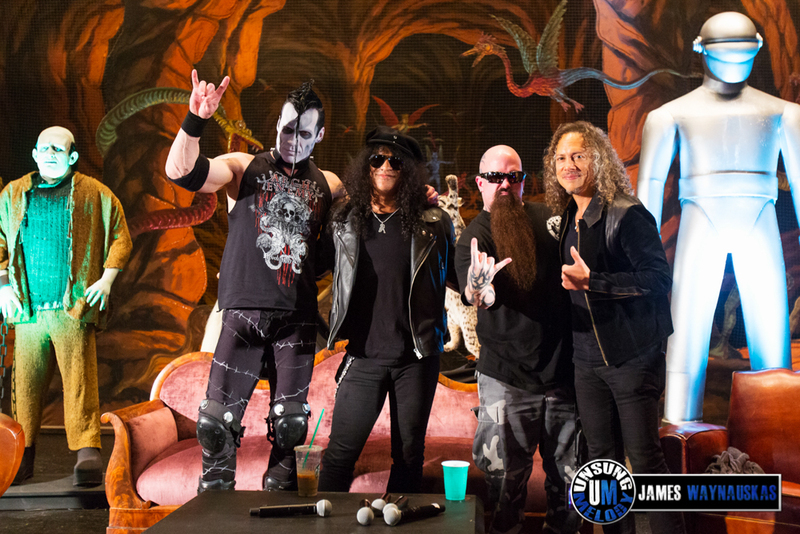 It was somewhat surreal to see these four legends of metal sitting on a couch with Slash sipping a cold Starbucks beverage while discussing horror movies. They appeared to enjoy each others company while discussing how horror influences their music, their favorite horror movies and were asked their opinions on subjects like remakes of classic horror movies. Doyle is not down with remakes but the other three were open to them as long as they are done well. Once the panel ended everyone headed downstairs for the musical portion of the evening. First band up was Death Division who received a warm response from the crowd and put on a strong performance. Next up was Orchid, which gave the crowd a different kind of feel than the rest of the performances with their Black Sabbath style of metal. The final band of the night was Death Angel who put thrash metal back into the evening. They came out and played fast and hard. The crowd loved them as they played songs like “Thrown to the Wolves” and “Son of the Morning”. About half way through the set I was crouching to get a lower angle for a shot and a foot landed on the stage just a couple inches from my head. A crowd surfer nearly made it on stage before security whisked her away. To end the set and the festival Kirk came out to play with Death Angel. They started out with a performance of Heaven and Hell by Black Sabbath and then took moment to wish Death Angel singer Mark Osegueda happy birthday with Kirk playing the riff from The Beatles “Birthday” before finishing the set with “Trapped Under Ice” from Metallica’s Ride the Lightning album. It was a fitting end to the festival that seemed to be very much about Kirk’s love of horror. Here’s to hoping that the festival continues.